if I am going, to be honest, at the beginning of the series, I wasn’t sure about the main character, Susan. She was a nosy snoop and I didn’t always like her. Now I realize that the author was very smart in the way she developed this character and also her supporting characters. Susan has grown over the life of the series and is now one of my favorite characters. Is she perfect–absolutely not–but that is what makes her real and makes her a good mom and most of all a good sleuth. In Murder is Medical Susan and her husband are in St. Louis, MO for a Match Day celebration to find where their son will go to Medical School. I could relate to Susan’s feelings when it comes to her children and wanting them closer to home. Her husband suffers a medical emergency and while he is hospitalized Susan gets herself involved in a murder mystery. I felt the author articulated the concern we all feel when someone we love is ill so it was very relatable. Another addition to this book was a new friend that she meets who helps her solve this crime. The addition of a friendship forming was also something I could relate to because we all meet friends in the strangest places. The plot was easy to follow, hard to guess, which you want in a mystery, and pure joy to read. I would give this book five stars and I would recommend you read the entire series. You won’t be sorry if you like Cozy Mysteries. When Susan and Mike travel to St. Louis to find out where Evan will be doing his residency, the Match Day celebration takes a deadly turn. The dean of the medical school dies at the reception. Was it a heart attack or was it murder? Kept in St. Louis due to a personal crisis, Susan teams up with the mother of the detective assigned to the case. It’s double trouble as the duo uncovers secrets worthy of murder. Meanwhile, Susan confronts her biggest fear–losing someone close to her heart. Set in the biggest small town in the country, Murder is Medical takes you through a whirlwind of suspects and emotions as the mystery is unraveled. Diane Weiner is a veteran public school teacher and mother of four children. She has enjoyed reading for as long as she can remember. She has fond memories of reading Nancy Drew and Mary Higgins Clark on snowy weekend afternoons in upstate New York and yearned to write books that would bring that kind of enjoyment to her readers. Being an animal lover, she is a vegetarian and shares her home with two adorable cats. In her free time, she enjoys running, attending community theater productions, and spending time with her family (especially going to the mall with her daughter and getting Dairy Queen afterward). Soon to be released, Murder is Medical is the latest (book 10) in the Susan Wiles School House Mystery series. Clearing the Course (book 3) is the latest in her Sugarbury Falls series. A Deadly Course won an Eric Hoffer finalist award. Murder is Collegiate made the shortlist for the Chanticleer Murder and Mayhem Mystery Award. Follow her at dianeweinerauthor.com or visit her Facebook page at dianeweinerauthor. 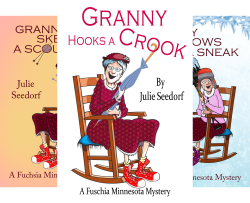 Next Post It’s A Fuchsia, MN Cozy Mystery Day!